Create a master template that reflects one of the independent states lists. For each data source, normalize to a copy of the master template. Doing this by source makes it easier to identify and address issues like missing values or observation for non-independent states. In the end, merge everything together. Since all the inputs are already normalized to a proper state panel list, there should be no issues. It contains the Gleditsch and Ward (G&W) as well as the Correlates of War (COW) state system membership lists. You can use it to build a country-year template that matches either the COW or G&W state lists. 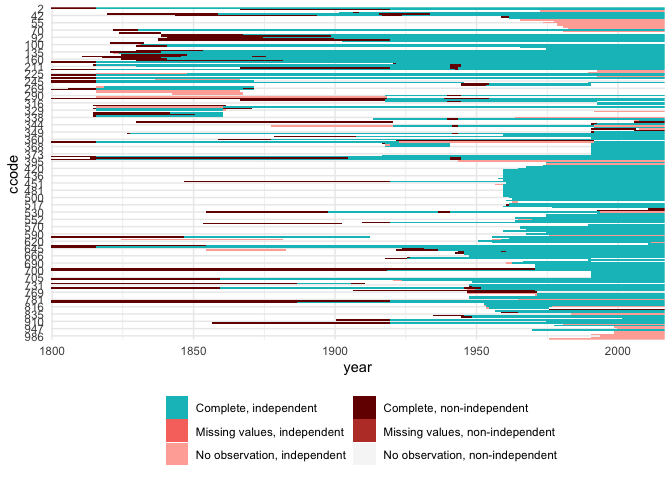 Visualize missing/non-independent cases in your data. See this related blog post for more details. Gleditsch, Kristian S. & Michael D. Ward. 1999. “Interstate System Membership: A Revised List of the Independent States since 1816.” International Interactions 25: 393-413.